Chris Holter, at left, is pictured with fiancée Carly Good. Holter was injured in a farm equipment accident New Year’s Day. HUNTINGTON, W.Va. — A young man injured in a farm equipment accident earlier this month has a long road to recovery, but at least he’s on it. Chris Holter, 26, was severely injured New Year’s Day when he became entrapped in a corn picker in Lebanon Township in Meigs County. Holter’s mother, Tanya Holter, said her son, who has been living and working near Toledo, had traveled home to get his corn picked from the field he planted this summer because it was easier to pick while the field was frozen. Temperatures that day were in single digits. Tanya said Chris’ right hand and left leg became heavily entrapped in the equipment, and his right leg was cut by the knife, requiring 15 stitches. Alone in a cornfield, with no cell phone and no cell signal anyway, it’s estimated Chris was literally stuck in that machinery for an hour to 1.5 hours. It was only when a neighbor returned home, that Chris had an opportunity to yell for help. The neighbor heard the call and emergency personnel were alerted. Tanya said she thought it took around 40 minutes for emergency personnel to get Chris out, working as fast as they could with multiple cutting and extrication tools. She said it was so cold that day, when EMS personnel attempted to give Chris an IV while still entrapped, the fluid froze in the line. Never losing consciousness, his body temperature when EMS crews arrived was 88 degrees, according to Tanya. “Had it not been that cold that night, he probably would’ve bled to death,” she said. After being extricated, Chris was flown to Cabell Huntington Hospital where he’s been ever since, going through five surgeries with more to come, including one today (Wednesday) to help repair his leg after being crushed in the machinery. Tanya said this will include the placement of pins, rod and a skin graft. The procedure could take up to 10 hours. This is the first surgery on this leg, as the focus has been to keep it clean and let it heal up to this point. Rather than amputate his right hand, a vascular orthopedic surgeon stepped in to help save it, Tanya said. It is now literally wired together. He’ll need more surgery on it but for now, the hand needs time to heal before reconstruction and bone grafts. He lost 70 percent of the skin on his right hand and wrist, Tanya explained. 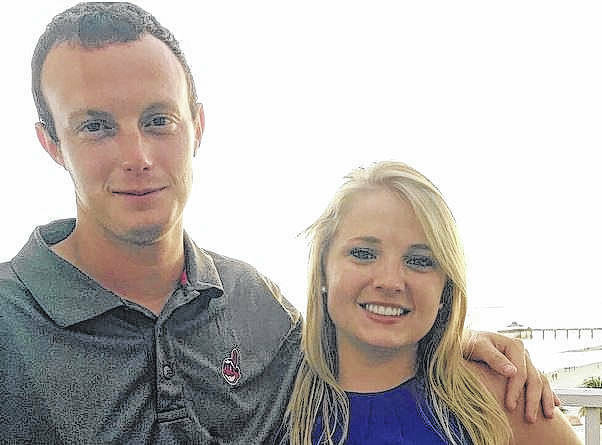 Chris, a 2009 graduate of Southern High School, had just bought a home in Findlay and is engaged to his fiancée, Carly Good. Good and Tanya have been by Chris’ side constantly since his accident. Luckily for Chris, his health insurance kicked in Jan. 1, the day he was injured. Still, the expenses with his recovery are expected to be significant, to say the least. For this reason, Chris’ coworkers at Southeastern Equipment in the Toledo area, have set up a GoFundMe account where people can make donations to assist with these expenses. Tanya said Chris was not asking for any kind of charity but appreciates his friends’ gesture to do something for him. For those wishing to donate, visit https://www.gofundme.com/chrisholtermedicalsupport to show support. In three days, over $4,000 has been raised to help offset Chris’ medical expenses. You can also go directly to the GoFundMe website and search “Chris Holter Medical Support” to find the page. https://www.mydailytribune.com/wp-content/uploads/sites/42/2018/01/web1_1.17-Holter.jpgChris Holter, at left, is pictured with fiancée Carly Good. Holter was injured in a farm equipment accident New Year’s Day.